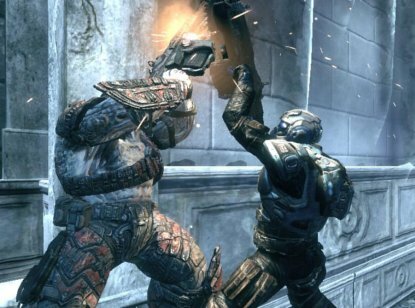 There's no denying it, Gears of War 2's online multiplayer is less then perfect. Ever since Gears 2's launch, the community has been demanding a patch to fix the various (and numerous) game bugs. Finally, Epic Games is speaking out about the patch, what it'll fix and has even informed us that they expect the patch to release sometime this month. Over on the official Epic forums, Epic's Mark Rein detailed exactly what the Gears 2 patch will fix and the enhancements that'll be made once the patch is released. You can view a comprehensive listing of all the fixes that'll be included in the patch after the break. And from what we can tell, the patch should resolve most (if not all) the Gears 2 exploits we've heard about including that dreadful melee through the wall exploit. Oh, we should also mention that the patch will bring some new Gears 2 achievements based on the DLC. How 'bout them apples? Gears 2 patch detailed, adds new achievements, set for Jan. release originally appeared on Xbox 360 Fanboy on Tue, 06 Jan 2009 09:30:00 EST. Please see our terms for use of feeds.